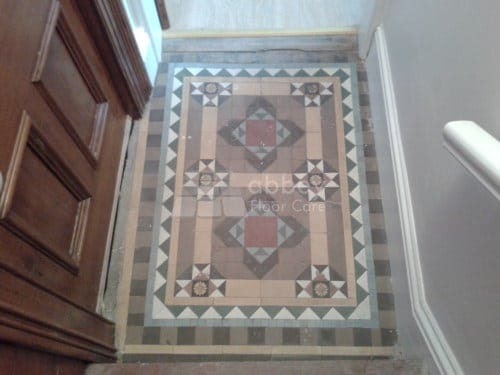 This house in Burton on Trent, Staffordshire had just been through major renovation, revealing a beautiful but tired looking victorian clay tile hallway. 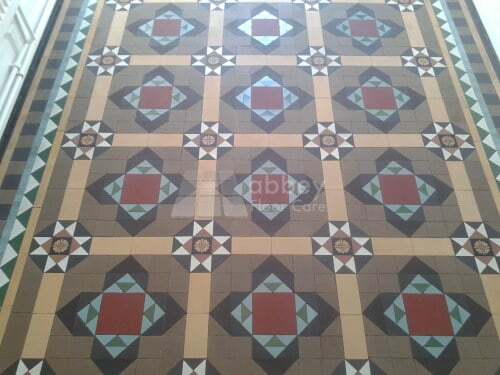 Considering the age of the property the Minton tile floor will have had a rich history, however it looks like the floor had been looked after quite well. There were no carpet gripper holes or bitumen coatings to deal with. The main issues were numerous old paint stains and ingrained soil from years of use. 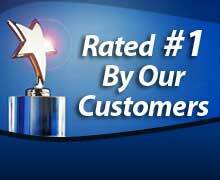 The first this to do was to protect the walls, staircase, doors and adjoining areas from cleaning splashes. I always take this precaution because some of the chemicals we use can damage paintwork and whilst I am extremely careful, better safe than sorry. In this case it took just over an hour to install the protection. 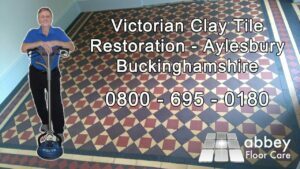 There are a few options to remove paint from clay tiles, water based and solvent based. Water based strippers work best when they are left for a day or two to soften the paint. Solvent strippers work more quickly but they can release strong fumes. 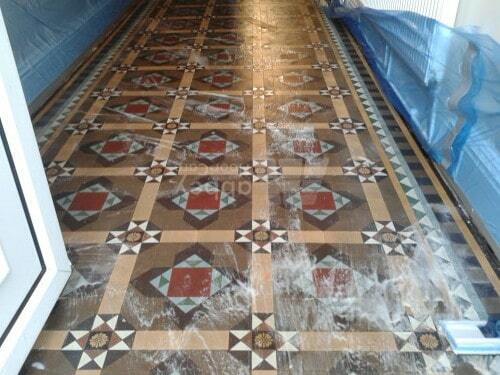 The customer wanted the work completed quickly so we went for a gel based solvent based stripper. A good coat of a solvent based sealer and paint remover was applied and left to work for a couple of hours. 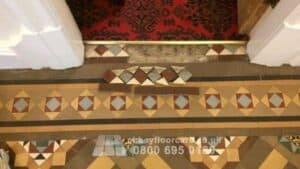 The treatment was carefully removed using our specialist moisture controlled extraction equipment. 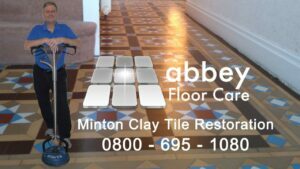 It is important not to use too much water as excess water can soak through the tiles into the subfloor. If the subfloor is earth or ash, then this could cause problems later on. Our equipment does not drive water into the surface of the stone. The water is combined with air to give a fine high pressure mist that sweeps over the surface of the stone, removing the bulk of the residues. Gentle - yet effective floor cleaning pads were used to release any remaining residues and ground in surface soil. The floor was rinsed again to remove the dirty slurry, leaving the floor beautifully clean and only slightly damp. Air movers were used to get the floor nice and dry, which took another couple of hours. 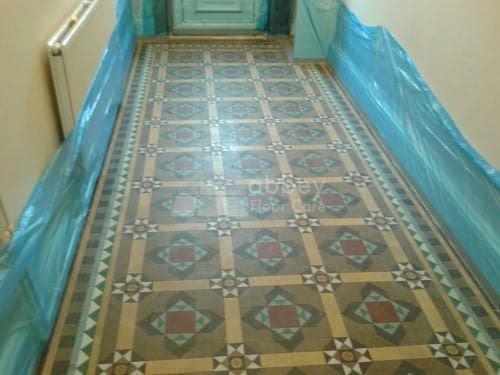 Once the floor was dry it looked beautifully clean, but the colours in the floor looked a little muted. 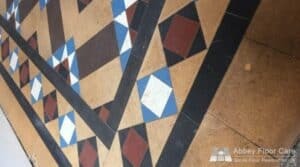 An application of stone oil brought the colour back the floor in spectacular fashion. An application of stone oil lifts the finsih. The customer wanted an easy clean shiny finish. We decided on a long life wax finish that is easy to maintain and gives a luxurious high sheen finish. Unfortunatley the light was too low for a photograph of the finished floor.